‘To risk my life had to mean something. Otherwise what was it all for?' Aged 12 Gulwali Passarlay fled Afghanistan for his life, after his father was killed in a gun battle with the US army and the Taliban tried to recruit him to become a suicide bomber. Smuggled into Iran by traffickers, Gulwali embarked on a twelve-month odyssey across nine different European countries. Even though a child he was imprisoned and beaten, suffering hunger, cruelty and witnessing man’s inhumanity to man on a daily basis. Like so many of the migrants we hear about, he endured a terrifying, life-threatening journey on a tiny boat in the Mediterranean and spent a desolate month in the so-called jungle camp at Calais. Somehow he survived, and made it to Britain, no longer an innocent child but still a young boy alone. Once in Britain he faced a two year to persuade the authorities his story was true. He was finally able to start school aged 15 Gulwali went on to carry the Olympic torch through his adopted homeland in 2012 and in 2016 graduated from the University of Manchester with a degree in International politics and a distinguished student award. He wants to tell his story - to bring to life the plight of the thousands of men, women and children who risk their lives to leave behind the troubles of their homelands. Many die along the way, some are sent back to face imprisonment and possible death, some survive and make it here, to a country which offers them the chance of a life of freedom and opportunity. One boy's experience is the central story of our times. This memoir celebrates the triumph of courage and determination over adversity. 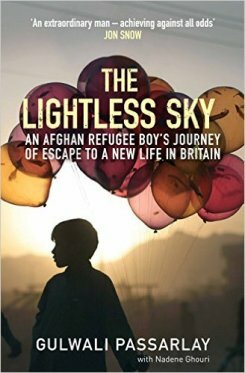 "The Lightless Sky is a heart-rending read that illuminates the plight of unaccompanied minors forced to leave their homes and loved ones. It is beautifully written (with the help of the journalist Nadene Ghouri) in simple, accessible prose." "The book, dedicated to his mother and “the 60 million refugees who are out there somewhere in the world today, risking their lives to reach safety”, is clearly written by BBC journalist Nadene Ghouri, who does an elegant job of humanising a story that has become a news cliché this year, navigating what she says are the sometimes hazy, unreliable memories of a traumatised 12-year-old child. " "This powerful and astonishing book is an important tale for our time." "Gulwali, now 21, has, with the journalist and author Nadene Ghouri, crafted a remarkably vivid memoir, The Lightless Sky, in which he details his dogged, uncertain, harrowing flight from his native Afghanistan across Europe." "Gulwali endured a horrifying, snakes and ladders journey across eight countries before he made it to the UK. 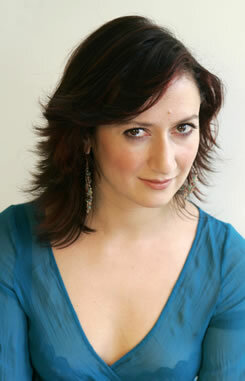 The full, riveting story is told in The Lightless Sky (Atlantic Books), written with award-winning journalist and broadcaster Nadene Ghouri. It is Gulwali’s story, but also a story of our times. "